Thermal insulation, what is there to know? Thermal insulation is the reduction of heat transfer (i.e. the transfer of thermal energy between objects of differing temperature) between objects. The most common 5 thermal insulation materials according to thermaxxjackets.com are Fiberglass; Mineral wool; Cellulose; Polyurethane foam; Polystyrene. The value R describes how good the certain insulation material is. Fiberglass is an excellent insulation material, with R-values ranging from R-2.9 to R-3.8 per inch. Mineral wool has an R-value ranging from R-2.8 to R-3.5. Polyurethane foam insulation tends to have approximately R-3.6 rating per inch of thickness. Polystyrene has the highest R-value of approx. 5. Here at TimberIN, we put much effort investigating the best thermal insulation options for our outdoor saunas and hot tubs. We think that thermal insulation does not only save energy and indirectly money spent to heat the sauna or hot tub`s water but it increases the lifespan of the product. If the thermal insulation is well made, one does not need to heat the air inside of sauna or water inside of the hot tub so often. That means less usage of the element and therefore a longer lifespan of the product. First of all, let’s discuss the thermal insulation options for outdoor saunas. Image 1 shows the cross-section of outdoor sauna`s wall. The “+” sign represents the warm room – the inside of sauna and the “-“ sign – the cold outside. Please pay attention that the ratio of material thickness was not taken into the account. Let’s name the main materials of the above given thermal insulation example. The first one (1) represents the wooden panels (44 mm thick); the second one (2) – humidity barrier. The main aim of the humidity barrier is to eliminate the penetration of water or vapor to the insulation layer (3). The nature of humidity barrier from outside and inside is different. The outside layer waterproofs the insulation and the inside humidity barrier does not allow the vapor to penetrate to the insulation layer. They both are very thin therefore their thickness is not mentioned. The fourth and the last layer is interior wooden panels, they are 20 mm of thickness. They are needed to support the insulation layer. It must be noted that the humidity barrier from the outside does not necessarily always have to be there. It depends on the type of sauna. The external wooden panels which form the wall of sauna are usually covered with bituminous shingles which act as waterproofing layer as well. If we were to compare the non-insulated and insulated sauna, their cross-section view is very different. The non-insulated outdoor sauna does not have the second, the third and the fourth layer. The interior wooden panels (4), as well as the interior benches, are usually made of aspen or linden. This type of wood does not heat so fast, therefore, it is much more comfort. The second reason is that aspen or linden does not produce a resin which is very sticky and you wouldn’t want to sit inside of sauna on something very sticky. Below images show how we insulate the sauna with mineral wood. Image 3. The insulation of the rear wall. The insulation of an outdoor spa is the most important factor speaking about the product`s life-span and the quality. It is utmost important to have the spa well insulated. We offer 3 different types of outdoor hot tubs. (1) outdoor whirlpools made entirely of wood; (2) outdoor hot tubs made with polypropylene inner liners and with wood decoration from the outside; (3) Outdoor spas made with fiberglass inner liners and wood decoration. Wooden hot tubs are made entirely of wood, therefore, they cannot be insulated. Hot tubs made with any kind of above-mentioned liners can be insulated. We offer complete insulation option which includes the insulation of walls, bottom, and lid (cover). In order to properly insulate our outdoor spas, we utilize either polystyrene panels or polyurethane foam. The use of material depends on the design of the hot tub. If the model is made with polypropylene liners, we always use polystyrene panels, on the other hand, if the model is made with fiberglass liner – polyurethane foam. The average thickness of our insulation layers is approx. 4 cm. Walls and bottom are usually insulated with thicker layers. Images (6, 7) below show the examples how the insulated walls and lids look like. Image 6. Insulated walls of fiberglass model. Polyurethane foam. Images 8 shows the insulated fiberglass and wooden lids. According to our tests performed back in 2016, the heating time of sauna and hot tub varies a lot depending on whether the insulation was present or not. The heating time (to 90oC) of the non-insulated sauna was about 60 – 90 minutes. The exact number depended on the size and type of sauna. We were able to cut the heating time to 30 – 60 minutes with proper insulation. As the result, we were able to save electricity or the amount of wood we used to raise the temperature of the sauna. So the benefit of insulation is obvious. The same results were obtained with the insulation of outdoor hot tubs. 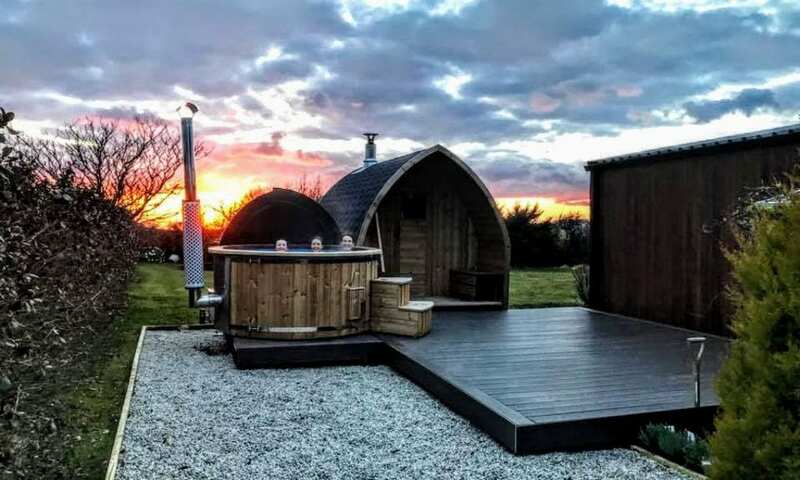 The normal heating time of non-insulated hot tub varied about 3 hours depending on the outside temperature (in our case, it was 5oC) and on what type of logs were used. Proper insulation cut the heating time again about 30 minutes. To our biggest surprise, the temperature drop during the night (-10oc) was only 4 – 5 degrees. Despite that, the proper insulation requires much labor work but it is worth it! Now we offer a complete insulation option for our fiberglass models free of charge! Grab one for yourself while the offer lasts!